Scott McCloud’s book really helped me to better understand what a comic really is; that it is essentially a sequential narrative of images with or without actual text. In this context, some ancient Egyptian stories carved into stone can be considered as early comics, which surprised and amazed me. I had always considered comics as a more recent idea than one that has been developing for centuries. Both forms of comics, web and physical, have their advantages and shortcomings. I personally enjoy reading through a physical book of comics, it feels more tangible and real somehow. 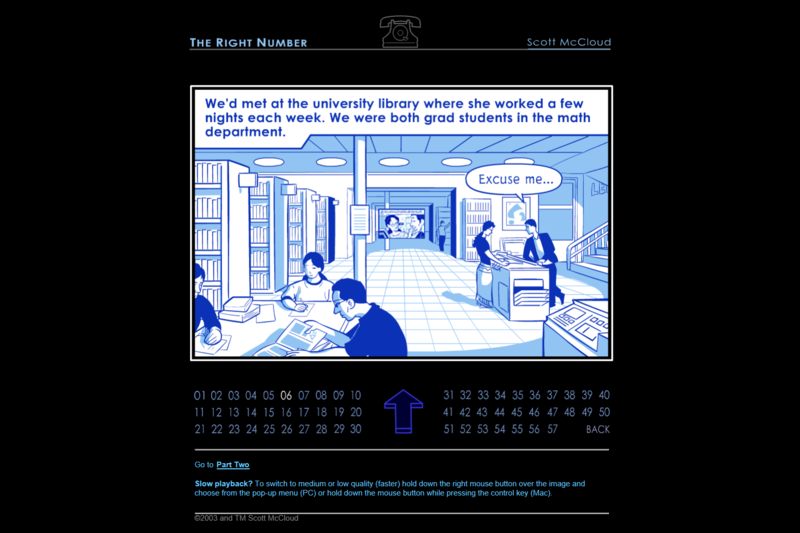 In McCloud’s web comic series “The Right Number” I found the zooming in to the next page to be an interesting mechanic to use. This mechanic did not allow you to glance ahead too far into the following sections of the narrative intentionally or otherwise. Usually in a physical comic book, I can look ahead and see what may come next and that can spoil the story but in the “The Right Number” it’s easier to focus on each individual frame as it comes along without getting too distracted. This method also allows for surprising events in the web comic to hold more weight since they are mostly unexpected. Of the comic books that I read in class, a couple stylistic choices stood out to me; in one, there was depicted a large scene which was bordered like a picture frame with smaller scenes that explained separate narratives as they were happening in the main scene. I thought this was a very clever way to include three different stories in only one page instead of dragging it out to several pages, which would make the reader much less interested. In other comic books, the use of changing the shape of the frames from the standard square to a triangle or some other shape helped to attract the eye to the difference in continuity and steer the narrative in a certain direction. McCloud using a zooming mechanic for his web comic series. In drawing my own comic, I would most likely prefer it to be a physical object that people could pick up and read. I would like to be able to post it online, but it would be made in a style for physical printing. I’ve made a few short comic strips in the past, and I always enjoyed the more comic book style as opposed to formatting it for a web comic. 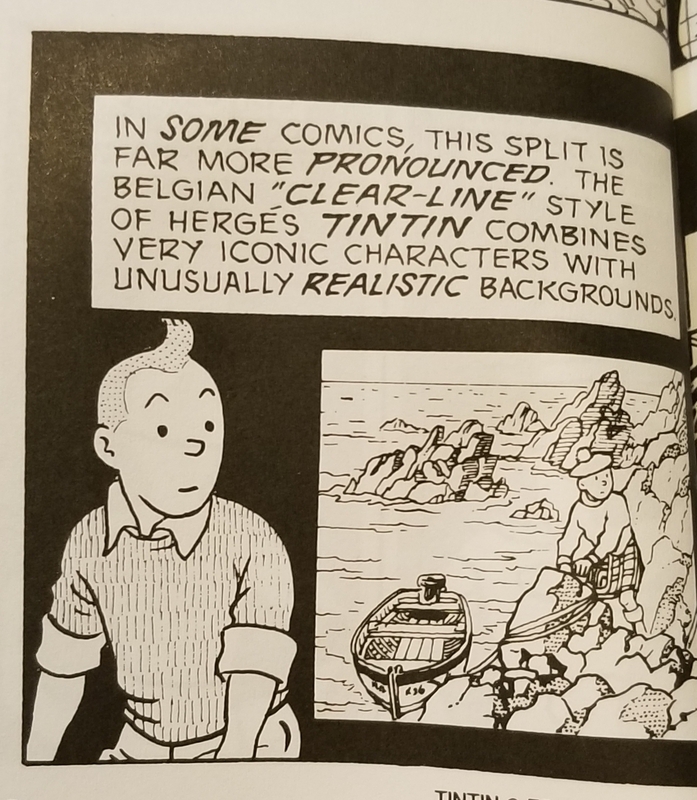 One style that I love, and I would most certainly use in my comic, is the photorealistic backgrounds mentioned in “Understanding Comics.” This style gives a massive amount of weight and realism to the picture and contrasts drastically with more simplistic characters, making it more notable. This would be perfect to help the readers become more immersed and involved in the story, by envisioning themselves in that realistic-looking world. McCloud describes a style of a realistic background used with simplistic characters.